At some point of time, all parents would have witnessed their child telling no. After the NO, comes the power struggles and the temper tantrums. It is an universal phenomenon and experts console parents saying that they are witnessing the terrible twos and that it shall pass .....in to tremendously terrifying threes, frightening fours, frustrating fives, shocking six..... my amma swears that I am going through a tiresome thirty three phase right now and is waiting with all toes and fingers crossed for ‘my phase’ to get over. The phases are a complicated play of wanting to establish an identity and earning respect and approval. The best thing for a parent to do is to step back and realize that they are not alone. The very thought that zillions of parents, irrespective of time or culture are going through the same thing at the same time gives immense strength and patience. This is the gist of the book beautifully conceptualized and illustrated by Mr.Warburton. Little Noah is sitting wearing his diaper and playing. In comes mommy and says that it is time to leave. 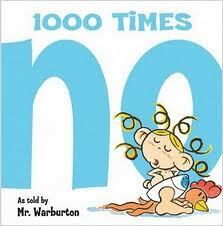 Even before she explains where, Noah says no, not once not twice, but a 1000 times. no..NO...reverse-no-on, grumpy-mad-gritting his teeth-NO, cool-come-on-make-me-NO, big-72-point-bold-no, No-way-jose, nooope. He proceeds to say no in russian, greek, hindi, old norse, chinese, inuit, tagalog, sign language etc. Little Noah is so innovative that he says no in creative ways such as using the carrots and peas his dinner plate to spell out no!, as skywriting, he texts no, morse code(dah dit dah dah dah -. ---). Found the whole book as an animation here. ROFL! Wont say NO (in any language) if you get us this book! This one was written for my son, NO mistake about that :P Talk about power struggles! Loved the review, thanks! LOL at 'tiresome thirty-three'! Next in line, Chox. I won't say NO either. Not even in the frustrating forties! As said in your blog, Na loved this book when I read it out to her. She was fascinated to note that there were so many ways she could say her favourite word! Read this after your reco on my post, utbtkids, and I must say, it is quite an interesting book with such a simple concept - nice to know how to say 'No' in all these languages, eh?! Most amazing, hilarious, adorable book I’ve seen in a while!